A magical evening occurred last month on a beautiful farm by the bay in Wittman, Maryland – an al fresco dinner, to which a few of us lucky souls were fortunate enough to be invited. Both the meal and setting will be remembered for a long time to come. And even more impressive than the natural beauty of the site, the graciousness of the host and hostess and the many talents of those who caught, grew and skillfully prepared the bounty of sumptuous offerings we gorged ourselves upon was the company, itself. It’s hard to recall an evening coming together so perfectly. It was supposed to rain, but instead the sun came out and set with a lovely blush to match the delicate Charles & Charles and Sancerre Rosés. Some of us had not previously met, but we are now communicating regularly and planning future escapades. The event and, indeed, the menu was only casually discussed, but suddenly it all seemed to come together as if it had been planned for months. This is one of those great evenings that we see in photos and wish we could’ve been a part of. And, delightfully, we were. And it all came together in a relaxed and flawless manner that is the hallmark of great entertaining – thanks to the deft hand and eye (and taste buds!) of delightful Carol Bean (our hostess, chef, stylist and farmer), her charming husband Mark Connolly (a third generation waterman, who, along with his brother, caught the delicious fish we ate), Rachel Vecchio (a super-talented baker and pastry chef who supplied the desserts) and Kathy Bosin (a local blogger who graced us with her presence and charming dinner company). Carol popped the cork on a bottle of Domaine Du Pre Semele and we started nibbling dates stuffed with mascarpone cheese, rolled in chopped, dark chocolate covered espresso beans, then fresh, local peaches, soaked in a lemon verbena simple syrup, dusted with fresh lavender flowers, drizzled with balsamic reduction which had been grilled on the fire and finally ripe brown Turkish figs fresh from Carol’s incredibly productive tree, sliced over the most delicate and decadent St. Angel cheese, drizzled with local honey. It cannot be stressed how delicious this cheese was (it will be eaten again. Soon!). And then, just when we all thought things couldn’t get any better, Rachel brought out her now famous honeyed-thyme brown Turkish fig crostatas (made with local figs picked in nearby Neavitt and honey from Sand Hill Farms) served with homemade orange blossom whipped cream and an absolutely out-of-this-world rustic peach galette (made with peaches from Caroline County, and served with lavender-scented homemade whipped cream. Wow. Wow. And wow. We are still quite floored by it all and frankly, just longing for an encore! September, anyone? On a recent shoot in LA, we were charged with creating a little kitchen on-set and were just delighted by the results – thank you so much to the talented Kate Martindale for your amazing eye, fabulous taste and stellar talent – as always, it was a pure pleasure! And our food stylist, the lovely Rebecca Jurkevich not only whipped up some gorgeous, delicious pasta dishes, but also made a most delightful model, if we do say so, ourselves … thank you, all! This past July in Los Angeles, we were lucky enough to enjoy the craft services of our old friend, Oscar Eufracio – who, to the entire crew’s delight, whipped up a variety of healthy and delicious on-set treats. 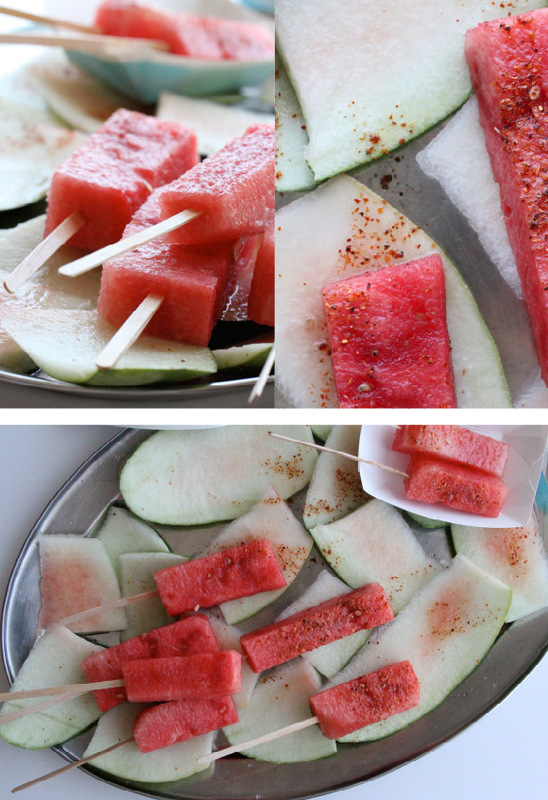 One of the most simple and refreshing was this array of spicy watermelon “pops” – thank you, Oscar, for the constant nurturing and inspiration! We missed this stunner the first time around in theatres last year. But just caught in on demand and it is, without question, unbelievably gorgeous. Directed by Terence Davies and based on the Terence Rattigan play, this beautiful swoon of a film starring Rachel Weisz, Tom Hiddleston and Simon Russel Beale will transport through its sheer loveliness (with Cinematography by Florian Hoffmeister, Film Editing by David Charap, Production Design by James Merfield, Art Direction by David Hindle and Costume Design by Ruth Myers). But this is not an uplifting evening in the making. Plan on a stiff cocktail or two and an episode of 30 Rock or the Daily Show as a much needed chaser. Lovely!